Men in Motion, first presented at Sadler’s Wells, has since been performed with great success in Moscow and at the Ravenna Festival, Italy. Devised by Ivan Putrov, this show is an exploration of the history of the male dancer over the last century. Since its first performances Putrov has had the opportunity to develop his ideas. 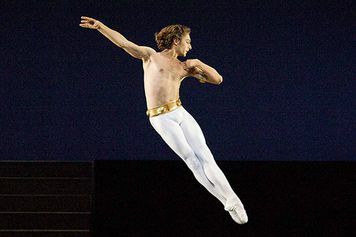 His research into the huge repertoire has revealed many fascinating pieces of choreography, which highlight the virtuosity and potency of the male dancer. He has also had the good fortune to collaborate with some of the most significant performing artists of this generation. In this program he is joined by an astonishing array of acclaimed dancers including Edward Watson, Vadim Muntagirov, Marian Walter, Daniel Proietto, Marijn Rademaker and Yonah Acosta. The celebration of 100 years of the male in dance starts with two iconic works - L'Apres-midi d'un Faune and Le Spectre de la Rose, and finishes with the dynamic and celebrated Two x Two by Russell Maliphant. There will be a new creation by Arthur Pita creator of Metamorphosis. The work presented in this show is a true treasure trove, with many riches, which will surely enlighten as well as entertain an audience, who will happily recognize old favourites, but also be dazzled by new and unfamiliar discoveries. Men In Motion is not available to book, please sign up to our newsletter for updates and offers on forthcoming and available shows. No food or drink purchased off-site including alcohol, soft drinks and water are permitted inside the theatre. Where is Men In Motion?